Catch up on our Ice Cream Experiments! Last time I blogged about making ice cream, we were planning to make strawberry ice cream. I used the recipe that came with the machine, which uses a no-egg base with the addition of sliced fresh strawberries. I should have realized that the ingredients added up to more than the 4-cup capacity of the machine, but I trusted the recipe since it came with the ice cream machine! That is, until it started threatening to overflow. I kept trying to push it down with a silicone spatula, but that was futile. By that time I'd already added the strawberries and decided that the mixture was adequately frozen. I scooped it out and transferred it to a freezer container. The flavor reminds me of cherry vanilla, except with strawberries instead of cherries. The ice cream itself isn't very strawberry: it's vanilla, studded with strawberries. It's not bad, but it's not what I want from strawberry ice cream ... you know what I mean? Combine the peanut butter and sugar until smooth. Add the milk. Blend on low speed until smooth and the sugar is dissolved. Stir in the heavy cream and the vanilla. 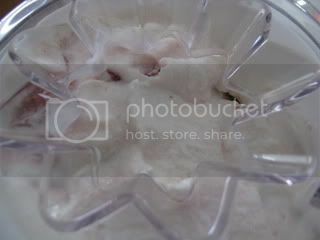 Place in your ice cream maker and let it run until it's as thick as it's going to get, then scrape it into a container. If you let it sit in a freezer overnight, it'll harden up and have the standard ice cream consistency you've come to know and love. This is hands-down my favorite homemade ice cream so far! It's a perfect blend of peanut butter flavor and creamy consistency. We have no photos because it disappeared so fast. We tried it with chocolate syrup, but decided that it's best with no toppings. For me, it's a rare ice cream that I can say that about, but this one is that good! I don't think I ever ate peanut butter ice cream. Too bad about the strawberry. It is one of my favorites and I would be bummed too. Never ever tried peanut butter but would love to some day. Man I so need one of those machines! I love peanut butter. I bet this was great. I made this tonight! I added mini chocolate chips. It was much thicker out of the machine than all of my other ice creams I have made, I guess because it was made with peanut butter. So so so yummy.